The Health Foundation analysis identifies the sum as the extra amount of Treasury funding the NHS will need by then because it is unlikely to meet unrealistically optimistic productivity targets. 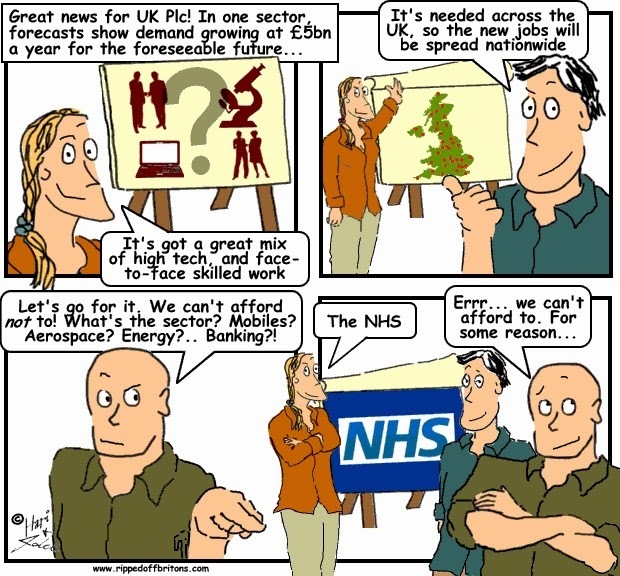 It says the NHS will need its budget to rise by 2.9% a year above inflation each year between 2015-16 and 2030-31 if it is to maintain the standard of services and avoid having to ration access to treatment. That 2.9% is higher than the expected 2.3% annual rise over that period in gross domestic product, which means the government will have to boost NHS spending faster than the economy is growing. The £65bn will also be needed because the health service is likely to make only 1.5% annual gains in productivity and not the 2% and 3% envisaged in the Five Year Forward View, NHS England’s recent blueprint for securing the service’s uncertain future. The Health Foundation wants whoever forms the next government to make reaching “a public and political consensus” on the NHS’s long-term funding needs a priority, and also to give it further additional money from April as a “transformation fund”, so new ways of delivering healthcare can be created.